Tomorrow is the day when I will no longer need to refer to my niece OR nephew. My brother and sister-in-law have their gender-reveal scan, at just shy of half-way through the pregnancy. Honestly, the last few weeks, my heart has been dreading the news. I know no child will ever replace Lily's spot as the eldest grandchild, however, I also realize that in a way, this child will replace many of the the firsts we would have experienced with her. That's just the way it is. Nobody is trying to be hurtful in it, it's just what happens as a result of Lily's death. So though I realize and am thankful that her status as first will not be taken away, the firsts of her life growing up on earth will be. That's hard to think about any child being the first besides her... but especially a girl. I have strongly felt like this baby is a boy, maybe partly because I want it to be and partly because I know Joseph has talked about how sweet it would be to have his eldest child be a boy, to watch out for his little sisters. My guess was that it would be one baby, which I was right about (we wondered since Joseph is a twin and Kala is a triplet), and that it'll be a boy. But who knows?? Only God until tomorrow. What makes the possibility of the baby being a girl so difficult for my heart is because things with a girl would be even more a reminder of everything we missed and are still missing with Lily. Any gender has similar baby experiences, but there are of course things specific to each gender... the bows, the pink, all that makes life with a little girl full of "sugar and spice and everything nice." I've asked God to please let this baby be a boy, to soften the ache in my heart. It's already hard enough, so can't He help me out here a little? Only those who have lost a child understand the inner turmoil in such things as this. I don't want to be selfish in my thoughts or feelings. I just wish the way my brain worked in things like this could melt away from me forever. Last week, I begged God to help me. I pleaded with Him to change my heart, to take away my sadness about Lily in this and to allow me to fully embrace this season and rejoice over this new precious life. I told Him that I know it's only Him who can alter my natural inclinations of feeling the way I do. Only He can make me excited. Only He can mend my heart and take away the sting of hearing the news if this baby is a girl. I want to be a wonderful aunt, able to give of my heart fully to this baby, not reserved in any way, because he/she deserves that! Joseph and Kala deserve that. A few days ago, I was walking past the baby section at Target and some adorable pink girly things caught my attention. 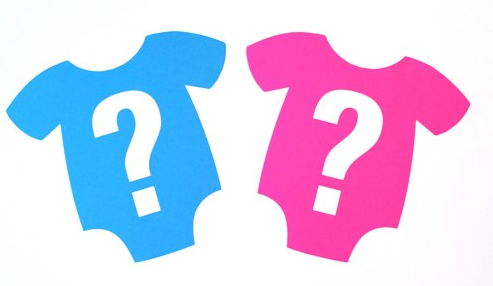 I was thinking about how adorable these items were and made a mental note that I'd like to get them if we find out the baby is a girl. And in that moment I saw what God had done... He was opening my heart to this baby being a girl. He was making me okay if he/she is a girl. I need to be okay with it before they find out the gender. How easy it would be to say I am okay with it after finding out the baby is a boy. God wanted to show me He is enough for me in this, no matter what the gender is, just as He's been enough for me in everything I've faced in my life without Lily. He is fully capable of giving me a new heart, with new feelings! If only I will entrust them to Him, surrender, and pray. He gave me the grace when I learned the news that this baby was on the way, something I had feared. I wondered why I was struggling after being okay with the news. But that's when He showed me that He gives me today's strength for today. And I cannot depend on yesterday's or tomorrow's strength for today. He meets me in the moment I'm in and sustains me there. I cannot explain the joy I feel in witnessing Him transforming my heart, my thoughts, and feelings. I am eagerly and excitedly awaiting finding out this baby's gender and will truly be pleased as punch, boy or girl! I cannot wait to meet that baby and hold him/her in my arms. But until that day, I want to be there for Kala and Joseph, helping them make beautiful pregnancy memories, like taking maternity photos, and getting a belly cast... all the important things I wish I had done with Lily. All things she taught me the importance and beauty of and because of her, they will have the things I never did. There are so many things I am seeing that I want to buy or make for my niece or nephew. My Father in Heaven, thank You for giving me Your love for this precious child whom You adore! Read the first post I wrote about Lily's cousin by clicking HERE.